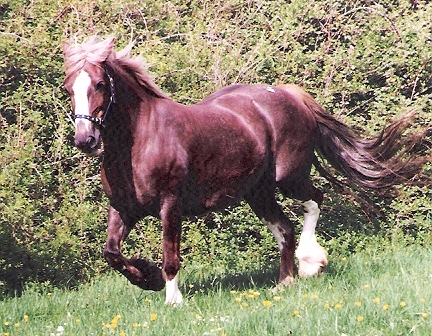 We bought Sundew at the Spring Cob Sales in 1991. She was a grand old fashioned mare whose grandfathers were Hendy Brenin and Llwynog y Garth - both born in 1944. She refused to leave the yard on the day after we bought her back from the sales until she had been served by Ystrad Dewi Flyer! Over the next 8 years she produced 8 foals including two very successful ridden cobs - Rainhill King Flyer and Rainhill Fireaway (both by Ystrad Dewi Flyer) and our brood mare Rainhill Rosebud by Pentrefelin Taliesin. Sundew died in 1999 a few days after giving birth to Rainhill High Flyer.